There is a time when environmental issues align with other factors and you want to see how another way of life might look. Such was a time for Ron Erickson, procurer for the insanely wealthy. Willits' been hit hard lately and feels the nessesity to be self relient. The hippy values fuel the community of sustainablity . . . 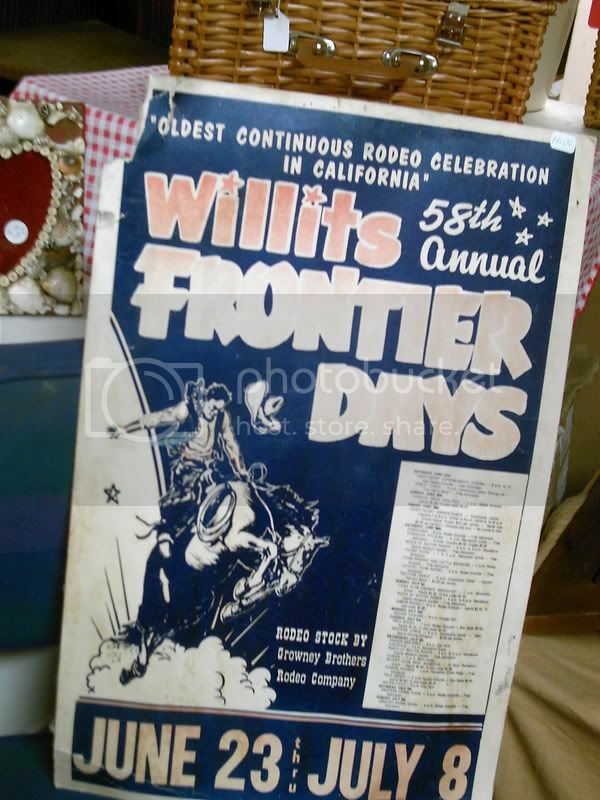 The wild wild west is well expressed in the humble setting of the emerald triangle of California. 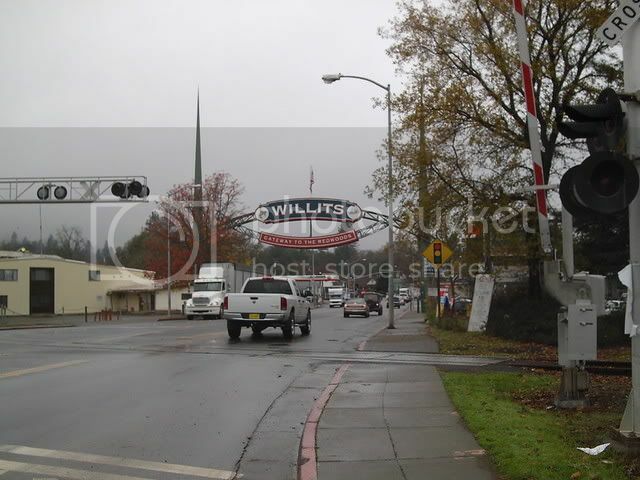 Gotta love Willits. The sound message that some good old time on your knees in prayer is as good or better than the scholarly study of God is a strong possibility. 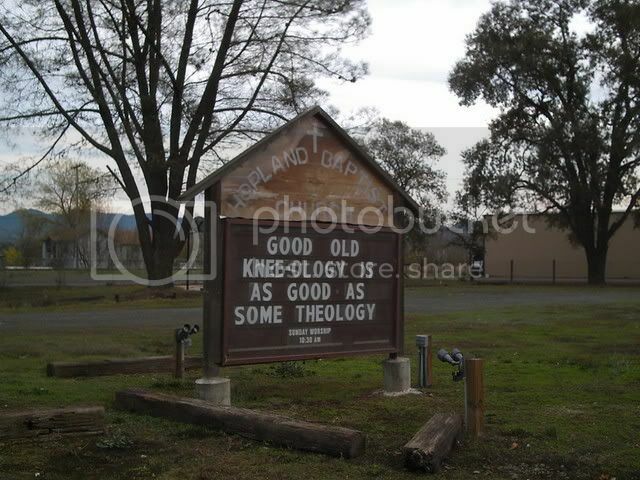 . . and to those who think the world doesn't have a prayer well that's just not true in Hopland and Willits. 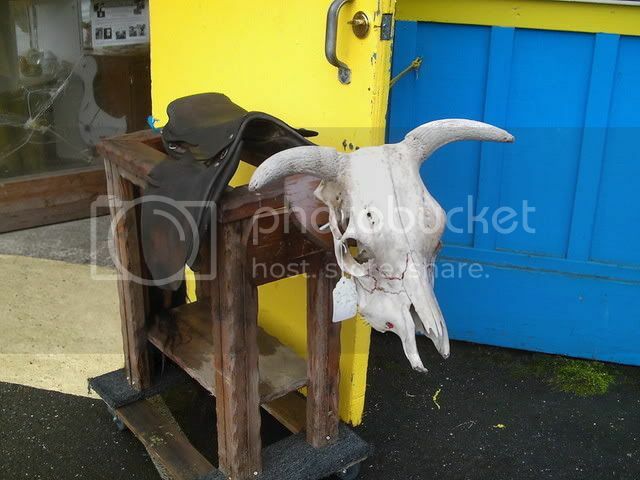 Think of it a dried up bovine skull loosely attached to a handmade end table sporting an English sadle nailed to a piano dolly and some call it Southwestern Art . 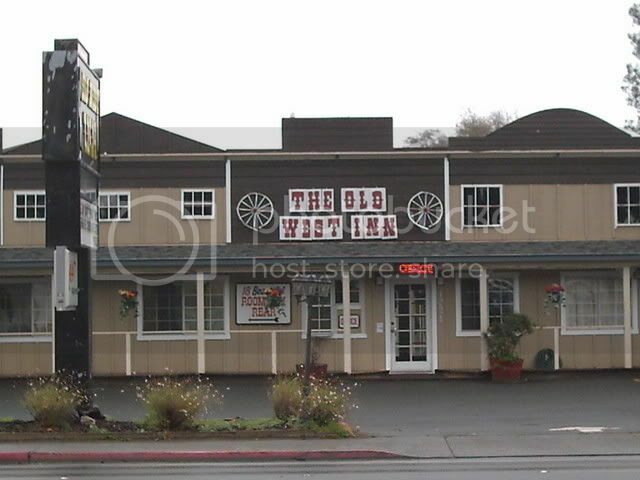 . .
Willits has few inns and motels to choose from . . . Ron and I were tired and there were plenty of vacancy signs . . . so we picked the zaniest motel we could find . . . we stayed in the back in a room called the livery stable. A nice place serves Sunny D for breakfast in the tiny loby. The wagon wheels made me feel right at home. 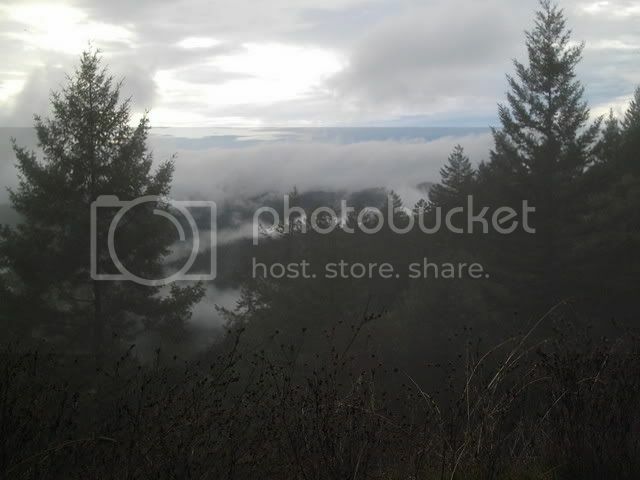 Somewere between Willits and Fort Bragg the forested mountains are breath taking. Almost every turn out has bucolic charm . . . it's a struggle for many of the Hippy/Redneck Coalition but the surrounding nature makes it all worthwhile. Sustainability is only possible with a strong sense of community. 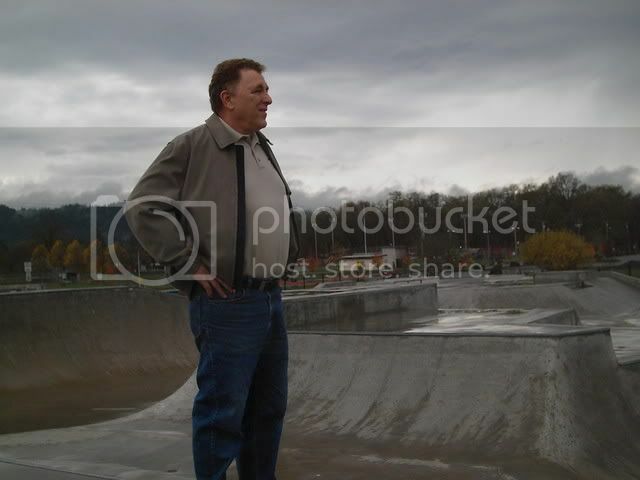 Ron admires what Willits was able to do as a community like build an amazing skate park so young people have a place to practice their olli's. Ron and I rode the byways and parking lots off Coast Village Road and skated back to Rancho Bozo for refreshments 1976 through 1979. 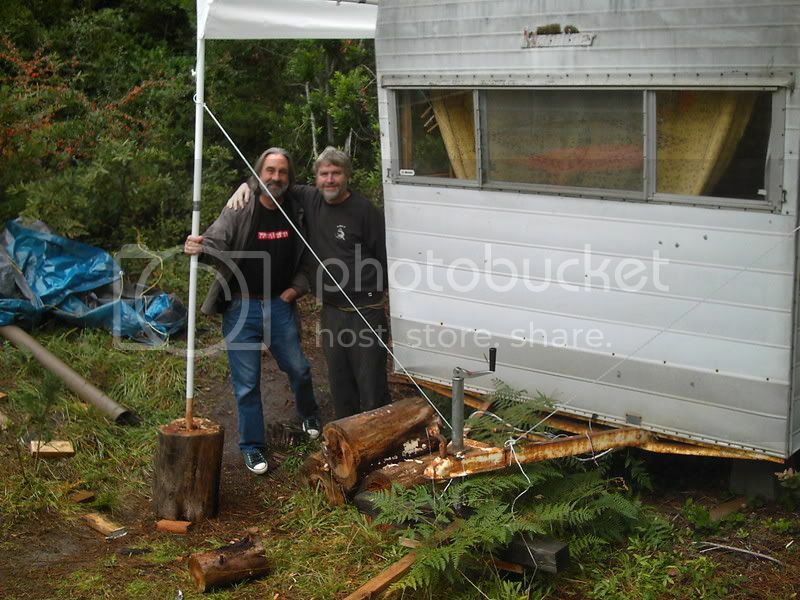 This little sixteen foot camping trailer is the home of that amazing radio station KNYO of Fort Bragg. Shhh . . . listen you can hear KNYO streaming. Ron and I were guests on Sean's morning show. Quality community broadcasting from somewhere on Sean and Liz's ranch. We traveled on through our road trip to Sean Keppeler's ranch in Fort Bragg, California. Thank you ~de Mas Mucho Machacho~ Capt. Wayne-o.& Intrepid promotional trips du jours tours courtesy of RanchoBozo.com It really does it, it really makes it, to just be so cool, to just make it happen. Three Cheers to the realization of the Boz.. May your Rancho be rockin up el norte, de norte way. So wheres the part about milling around campfires at twilight. you ask? One is being lit up right here, where the heat is radiating from. Oh yeah, fire. Being a bit good in keeping off the cooling winds right around sunset. Also pretty useful for heating up some grub. Fire energy is really useful with enabling the light. But overall the effect of campfires use is in the making of a circle. Yea, thou sayest, we're forever drawn into circling round the energy. Envision standing around that warming circle. Campfire mantra. Or perhaps you may just be squatting there around that fire. Hey, Woa pardner', you best remove those spurs before they spur ya right back. The spirit of the west, by Jove that is one spirit Wayne & I both restlessly elect to imbibe in,. Realizing that our journey is the goal kinda aids streamlining our trips into harmony. Wayne, one to take things a step further might certify those spirits speaking through our native inner voices. And in northern California this all pretty much seems like a natural given. That much of the special love we have for particular places is imbued with a tad a' time worn sophisticated nostalgia. As if we are getting back primordial warmth from some beckoning of familiar spirit. You begin feeling the warmth of that glowing energy emitting from the wood burning center. Radiating, penetrating inward. The warmth of Campfires at Sunset. put a little more hair on the chest now for the action, later for the rest. Are you narrowing down your search for a job? or are you searchin' for a job that will widen your perspective? I've got one for you. I'm in need of God's co-pilot. The jesuit of the road is calling..Wheels are turning,and the blue highway calls. I will be on vacation starting the 6th. and coming to your town soon. The bus will be boarding & the tiger is in the tank. We are both straighter than we've ever been or maybe ever will be. But the road is long and winding. Shall it be the roll of the dice? Can you leave your brother behind? How bout it. It's time to open another front on the war against bordom ? unedited correspondence R.E. & W.E. 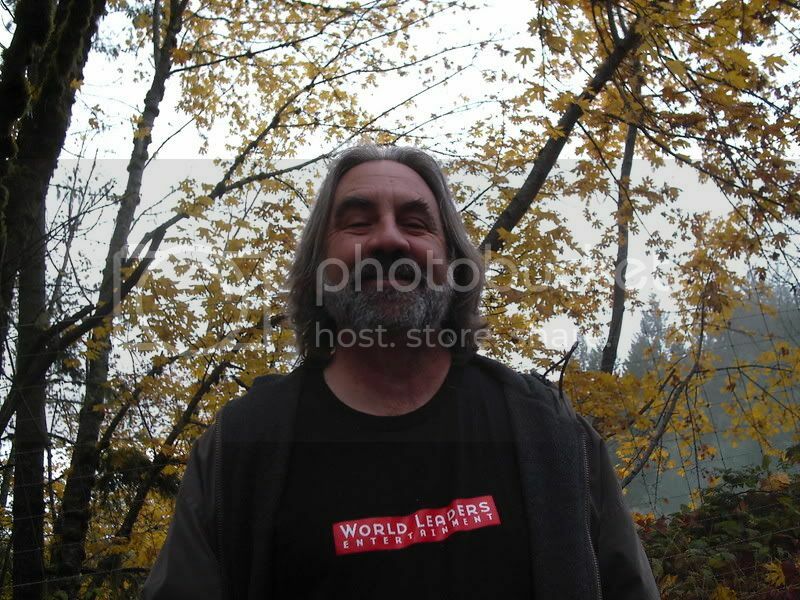 In the cold and damp of Mendocino County the leaves were falling during a more cosmic moment Captain Wayne-O in bliss . . .